Discussion in 'Transformers Toy Discussion' started by rcal7109, Aug 23, 2010. With all of the new awesome stuff coming out in the coming weeks like munitioner and explorer, I was wondering how many items you usually let accumulate before you have BBTS ship your loot? What is the most items have you had in your POL before you had it shipped to you? Also how many items if any do you have up for preorder now? 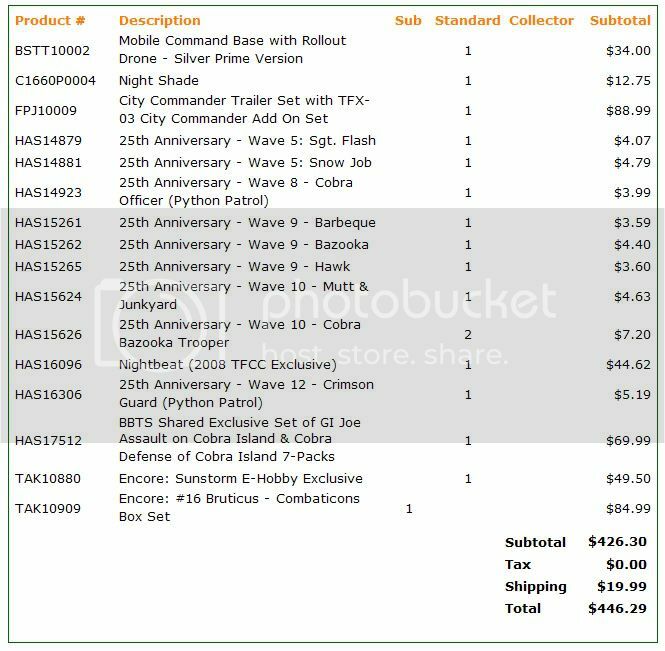 Edit: Added my orders from BBTS. A small order compared to Firehawc_69. 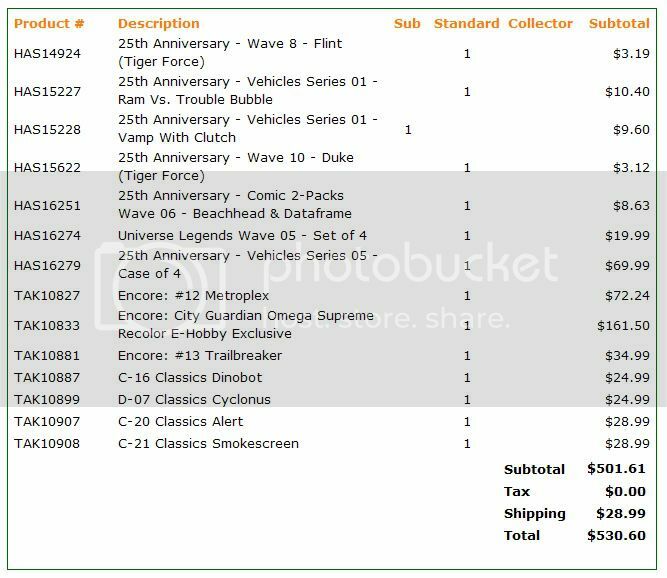 Going to have a large, expensive box coming from BBTS in the next few months. this was my biggest pile of loot. Damn! That is a POL! I can never wait that long. I've got Munitioner and Explorer on pre-order and for weeks its been my aim to ship my POL the second those two are processed and added to my pile. But at this rate... according to TFWiki's calender, Animated Rodimus is released in Japan on the 28th, whom I also have on pre-order so I may just wait for him to arrive as well. Over the course of a couple months. Around $100 is where I like to ship it out. My biggest will be the one I will be shipping in a little over a week should be near $500 worth all told. Mine never accumulate for long. As soon as my friends get their stuff, if its in my pile it ships. I usually ship once there are 2 different items unless I know something new is showing up soon. Right now I've got a Hasbro MP Prime (the one with short chromed smokestacks) and a Universe Ratbat (loose) in my POL. 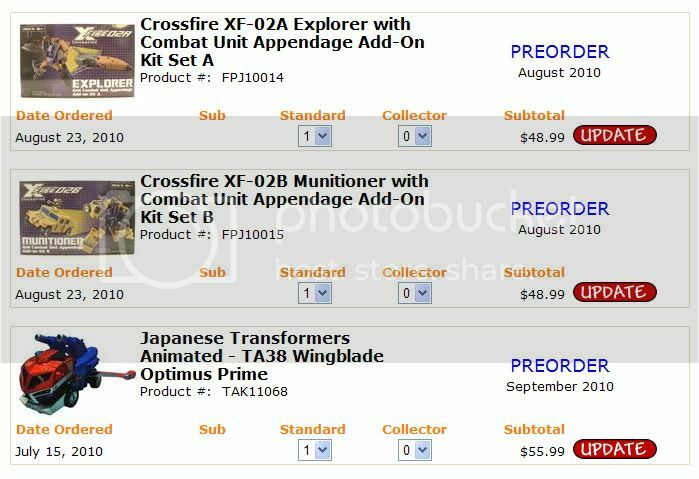 Wingblade Prime, Elite Guard Prime, Munitioner and Explorer are all on preorder. I'm shipping it as soon as the two FP releases are in. this is my current PIleof Loot willbe adding a good bit more pre ship. I don't know know the dollar amount, but I tend to leave things in there for quite some time. I think I even have FP's Aerial Team kit for Superion in my POl right now, which I ordered sometime early in the summer of 2009. (That's admittedly strange as I think they are supposed to automatically ship at 180 days.) I'm waiting for FP's Crossfire set (and maybe the Hothead set) before I ship. And this will be my biggest POL in terms of dollars. If a few more things get added, it might end up as more items but probably will never get to be a bigger box than that first one. Unfortunately i can't contribute - i avoid POLs because customs in my country will screw me left right and center on them, and then charge me a fee to process the fee. I don't use bbts since i don't want to share my credit info. . I very much doubt BBTS would rip you off, and even if something went awry, most credit card companies will cover you for fraud. My PoL is right at $300 right now. I'm still waiting for the Fansproject sets to hit before I ship them out. 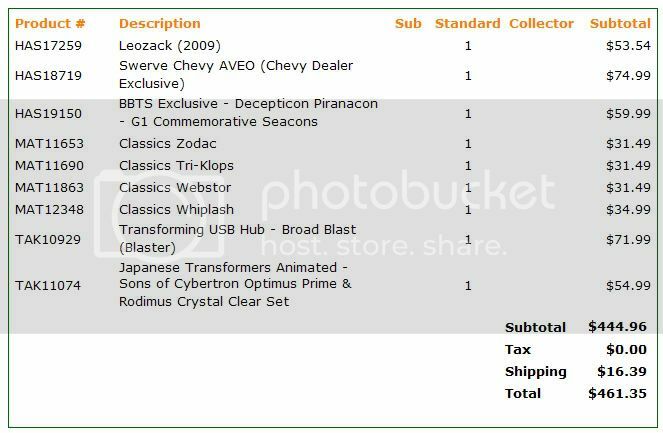 Though, I've been thinking that if they don't arrive this week, I might just wait for 2010 Unicron to hit my PoL before shipping it out.